So, you’ve decided to get a reining horse. You have seen the glossy images of horses sliding and those stud horse advertisements. You visited some shows, and wow you are in. You have been told it’s the greatest sport on earth and you want to be part of it. You have heard all about the futurity, and that seems to be the conversation all the trainers want to have. There are horses advertised for sale but its hard to know where to start. Your friends all start advising which trainer is the one to use and what a great fella he/she is too. So, the first thing that becomes obvious is you need to get a professional reining trainer. Rarely does anyone take on being in reining without a trainer nowadays. These animals require specialized schooling, training surfaces, shoeing if you want to be competitive at even the lowest levels. You also need assistance in finding the right horse – a sound one if that is possible. You are about to potentially pay $20,000 – $50,000 – $100,000 or whatever sum over to a person that could do whatever they want with your investment or passion and leave you with nothing. From this moment forward is when fools can part with a lot of money only and end up with a broken down, out of fashion horse that is of no value. Trainers have a unique way of dealing with their clients. Many operate on the basis of how much money can they drain from your pocket in pursuit of their personal goal. They want to win a futurity and the owners fund them. The lower ranked trainers have their own special kind of story. They have learned how to keep horses in barns for a longer period of time, so they feed their families each week. They don’t have the prize money to live off, so they are a good salesman. It’s a survival skill they learn early in the business. They are always on the lookout for what is referred to in the industry as the ‘dinner plate horse.’ An owner that is excited about having a horse in the futurity and dumb enough not to question what is going on. They also come with a healthy bank balance that will hold together for two years. Then there are those trainers just starting out that talk of great feats of ability as a non-pro and now hang out his or her shingle and proclaim, “Today, I’m a professional horse trainer.” They don’t like working nine to five and decide that a life of training horses is the way to go. Do what you love is what the guru’s tell people to do. They have little experience in managing horses outside of their own, low levels of veterinary knowledge and certainly have not been astride enough horses to add real value to the process. Their fees are a little lighter, but so is the feed bucket the horse will get. They are usually cutting corners on everything, including your horse’s welfare, to keep the lights on in their house. Isn’t funny that everyone seems to be meeting many of the bad ones and not too many of the good ones these days. Did you know that thousands of horses are started for the futurity each year? It’s the business of the NRHA – a futurity. Look at the entries that made it through to the event, and the least heard the excuse for a horse not being there is the client ran out of money. Most horses have broken down mentally or physically in the training regime of drilling them numb to complete a reining pattern. People say, get references before picking a trainer. But here’s the thing. 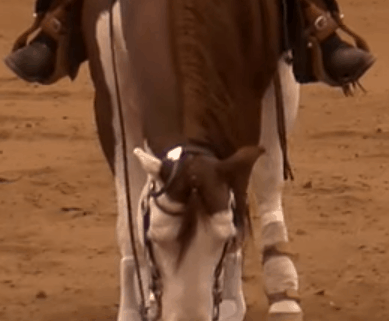 The biggest thing you will possibly learn about the reining horse business. The top trainers have another little skill that no-one new to the industry knows about. The skill of hiding their skeletons and being rid of the evidence. The lesser trainers have the same skill but often not the expertise and political power. The one thing that is standing out to Reining Trainer Engima now is how many people have a civil action against top trainers, and other lesser trainers, for abuse of their horses and welfare problems. Horrific tails of what happened to their animals and the common fact is they, the client, is now exiled from the reining horse industry. To participate in reining, you have to accept the horses are wastage or you’re out on your ear. For people that have a passion for horses and a touch of kindness in their sole, it’s a hard lesson to learn at the suffering of your horse. Those reporting to RTE their experiences often sought support from the NRHA only to be told it’s not in the rule book so move on. They have a lawyer on a retainer to manage those squeaky wheels called owners. The NRHA ignores what happens outside of the pen, even though one day they decided to publish their Code of Ethics. You have wonder what their intention was. To the newcomer or the unsocialized owner, they would be unaware of the issues in a specific training barn as huge prize money means trainers cannot be questioned – the client is always wrong and just a troublemaker or stupid. No other industry would have such arrogance but reining (and other horse disciplines) prize money brings immunity. This makes reference checking hard, so most people learn through their pocket as they are lured by the salesman. Back to the purchasing of a horse. Trainers make good money on sales commissions of horses so they can always fit you out with a horse or two or three. They will tell you romantic stories of its breeding and lure you into writing out a nice check. You finally settle on a horse and after many x-rays and disappointments of failing vet checks (hopefully, you got x-rays) you find your new dream. In fact, the trainer helped you find two. One for you to ride and one for them to take to the futurity – what a great guy/gal. 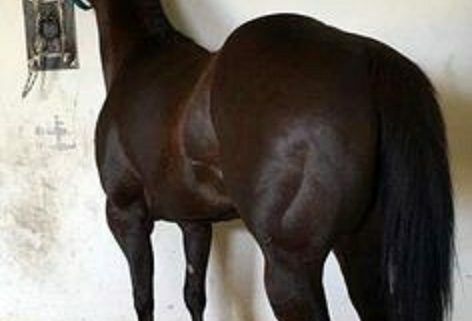 Do not put a horse that is not bred by the trainer’s stallion (or tops client stallion) as it will rarely make it. They support their own stock first. Make sure the person can get along with a mare/stallion/gelding. Some trainers cannot work with some genders. Be aware that other top clients (ones they have romanced for some time) will always get the winning ride. It’s a loyalty thing – intentional or not. Their horse always gets that extra bit of care. If the trainer does not get excited about your bloodline – step away immediately. Don’t try and convince them and don’t let them give it a go. Many people report of trainers taking their money only to turn around and say ‘gee I hated that horse’ of ‘I knew that bloodline was useless.’ Nice bit of information to find out after you load it up on the trailer. You start on the journey, and the expectations are set of what the horse can potentially do. Here in lies the trap. How do you know if your horse is a dinner plate horse? Is the trainer really riding the horse or is one of the sidekicks on it? Is the horse being properly cared for with the right amount of food, clean stable, turn-out time and rugging? Is the horse stressing being in training, but you are not being told? Does the trainer even like the horse or is it last out to work, if it’s not too late that day. Is your horse spending seven days in a stall and worked only every couple of days? You can make regular visits to the barn but that is usually at a set time, and you get a stage show put on every time you visit. Unless you’re an experienced horseman yourself, with good knowledge of welfare and training methods, you can be quickly bamboozled. Remember: they are professional at doing stage shows to clients, they do them all the time. So, don’t think you can catch them out easily. These salesmen have burned some of the best breeders and owners. Make unannounced visits to the barn during the week. If the trainer does not like it, then bring your trailer. He is in a business that should be working horses daily. Don’t expect the trainer to drop everything and cater to you, but hang around and watch what is happening with all the horses. Stay around at feed time and offer to help. Gosh, the day you visit you may even get to see your horse worked and found it in a stall not tied to a tree out the back. If you are in doubt your horse is not being cared for or suspect your being led up the path; you can pretty much be sure it is happening. Don’t trust them, don’t believe their stories, verify everything and ensure you regularly visit your horse to oversee its welfare. Good Luck and remember the NRHA is not there for you. To solve this problem, the NRHA needs to be made accountable or remove their Code of Ethics. Please vote for change. © 2018 Reining Trainers Engima. Who is protecting the reining horse’s welfare? “Unfortunately we do have our share of abusive trainers in our industry that I consider a minority, and when identified, they should be removed, period. It is these individuals that attach a bad stigma to the industry” says Rick Dennis of Wind River in May 2015. A highly respected quarter horse performance breeder and competitor and author of many articles on horse abuse. You do not need to look too far to find examples of extreme reining horse abuse. In 2013 reining horse trainer Kyle Ronald Weston, from Alberta, CA was charged with horse abuse. The photo on this page is the result of his excessive spurring of a horse at home in his barn. The mares mouth was reported to also bleeding badly. The NRHA did not take any action against him until after he was charged by the law-courts. There are extremists everywhere in both the level of abuse and the animal rights advocates who don’t even want horses ridden. In the middle ground of treating a horse respectfully, there is a place for sound and logical welfare of the horses. Would you do it to a child? Then you should not be doing it to an animal is a constant measure. 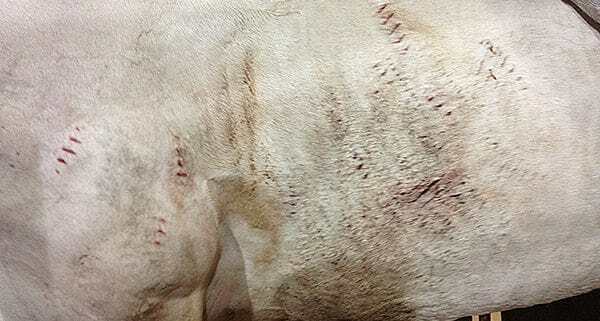 The over sight of horse abuse should not just be in the show arenas and warm-up pens, but back home at the barns. That is where the most of the abuse actually occurs and where people have the most direct experience with reining trainers. For their welfare, a middle ground must be struck where horseman from other disciplines can evaluate and define what is reasonable, not just people that are indoctrinated into a way of thinking like the culture of the reining horse industry. The problem is that the public, newcomers, and members are wooed by the photos of expensive barns of the extensive breeding and training facilities and horses presented like rock stars. The glitz of the show entertainment, expensive advertising campaigns and the lure of big prize money. This glamourous image is a far cry from how most of the horses live and are trained by the hundreds of people across the world proclaiming themselves as reining horse trainers. Behind this glamour are many tales of physical and mental abuse of horses. It is not just limited to the horse under saddle, but how they are treated in their day to day lives. What happens away from the spotlight and public eye and seen only by people investing in having horses trained, whether they are NRHA members or not. The truth of what happens can be seen with horses like trainers Weston’s and Arballo. Reining horse trainer Mark Arballo, a repeat offender of being charged for horse abuse, in 2015 was charged again over the horrific death of Bella. Again, with full awareness of the matter, the NRHA is reported to have not taken any action against this person until after he was charged by the law courts. 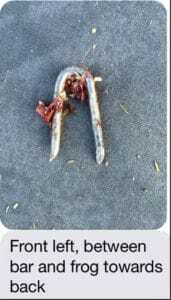 The shocking attack at the major show, Reining by the Bay, in 2015 where three of Andrea Frappani’s horses were poisoned, and one had a U-Shape nail driven into his foot. Horses at the top of the game that were targeted by someone who was most likely more motivated to win than care for the well-being of horses. A person that was either personally motivated or paid to commit extreme acts of cruelty against those innocent horses; evidencing a potentially highly competitive ‘at all costs’ culture within reining. For many people reporting horse abuse can mean the end of their involvement in an association. An association they have invested heavily in, both in money and emotion. The few that stand up for the horses are quickly finding there are few avenues for complaints that are not met with criticism and denigration by trainers and their friends. For some complaints, they are pushed toward the courts as the only option, where outcomes of such matters are reported to be unlikely to succeed due to the lack of knowledge and priority of animal abuse in the court system. Westons case giving measure of extreme abuse and getting just a $4,000 fine. For a complainant, trainers are often victimizing the person for speaking out as they see the person as turning in one of their own. Many trainers are quickly justifying their actions by saying the person knows nothing and vilifying the person relying on the cult-like behavior of their followers to support them. You will see many social media posts where they victimize the person who dares to stand up for horse’s welfare. Unfortunately and very real is the fact that many people reluctantly condone the abuse, by remaining silent, as the fear of being ostracized for speaking out against someone is more penetrating on them personally than living with the knowledge of a horse suffering out of sight. 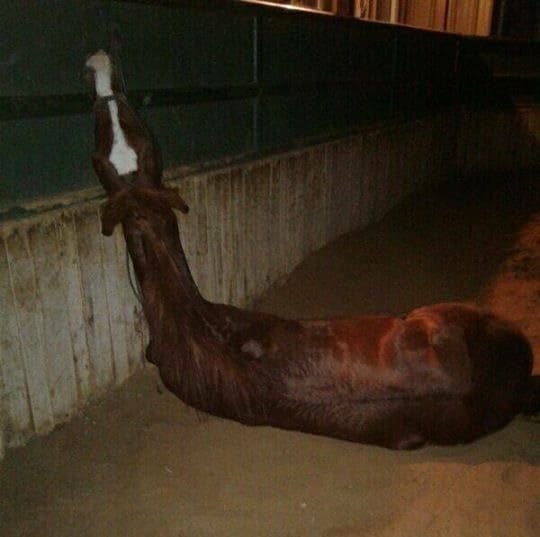 They attempt to reconcile the abuse through closing their minds or moving to another trainer. They fear becoming a victim of social media keyboard warriors as uninformed, often very ignorant and closed minded people make wild and often threatening statements against the abuse reporter. People who quickly protect the abuser due to their public persona and their desire to stay in the group, with little to no regard to the horse. The more the celebrity status of the trainer, the more likely this will occur. Could all of that really happen to someone reporting horse abuse? Sure, it could, and it does and anyone active on social media will most likely have seen it first hand. People are reaching out to Reiningtrainers.com, sending shocking stories of horse abuse and how they became the victim for attempting to help the animal. Some have just walked away from the reining industry, others have paid the price for speaking out and been pushed out. Moreover, an appalling outcome is the people that are attempting to live with the knowledge they let the horse (and more in the same barn) down by not speaking out. However, what would happen if you all would send a loud and clear message to the reining horse industry that you will not tolerate horse abuse at any cost? “The world will not be destroyed by those who do evil, but by those who watch them without doing anything.” Think about it and reflect on the horses. 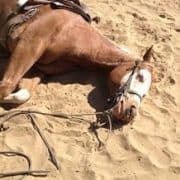 It is the responsibility of the National Reining Horse Association and its affiliates to provide the tools and mechanisms to permanently weed out the abusive trainers and give members and the reining horse enthusiast public the confidence to report their concerns. Set a standard by removing peer reviews of complaints where subjectivity is rife and, agendas can be at play. Install independence to ensure complaints receive the balanced hearing they deserve. A place where the horse becomes the priority and actions are taken to filter out those that are abusing the animals and setting a underlying standard of acceptance in the market. Are you concerned over a reining horses welfare – send us the details via our contact page. © 2016 reiningtrainers.com All rights reserved. http://www.reiningtrainers.com/wp-content/uploads/2016/06/Kyle-Ronald-Weston.jpg 450 600 Animal Welfare http://www.reiningtrainers.com/wp-content/uploads/2016/06/RT-LOGO2sml-300x174.png Animal Welfare2016-10-22 14:18:512017-05-31 02:40:21Who is protecting the reining horse's welfare?